Thanks a lot to my dear readers who have supported and motivated me throughout in this journey.I’m overwhelmed with so much love and support bestowed on our team. Thanks is just a small word to express my happiness for my readers. 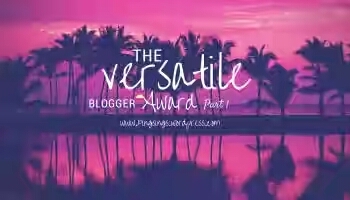 I have been nominated for this award by a lovely blogger hati03nisa.She is an amazing and friendly blogger. Her contents are must read .She writes with the grace and originality. 2)As I’m an introvert girl ,I always live in my comfort zone and talk less with people. 3)I like watching horror movies 🤗no matter how much I got afraid after watching it. 4)I believe in simple living and love to read Novels in my free time. 5)I’m little crazy girl and sometime behave in a childish manner. 6)I spent most of time with myself and with my writing. You all are my favourite and I enjoy reading your work.I want to nominate everyone here ,but it’s not possible 😢.There are many bloggers whose work I haven’t read yet,but very soon I will read it😊. Most welcome😊.You mean to say that we have something common like what? ohh.. I forgot to congrats u.. Many congratulations to you for this versatile award.. Thanks a lot for such beautiful comment. I’m happy that you like the facts. Thank you 😊.Would I know Your name? Omg… I see sooo many things myself in you😍😊😊😁😁😁😁 great!!!! Yes,sure .I will be honoured for it. It’s Okk.Its a very small thing you have asked from me .By the way which post.? I know ,every one here writes for himself not to show others.Writing is our passion,life ,a way to express ourselves to world.If I’m not wrong. Yes ,it’s for a reason .To show the contradiction to whatever I write .I’m not. a Aethist in real ,just a simple girl who loves writing more than her life. Lovely….!!! I admire u ans ur writing skills..
Oh,but it’s not my real name .My name is Gargi. OK…but Gargi is also nice..and surname? I think it should be kept secret here .You tell what’s your name? My name is Gargi Sidana ,I also have no secrets. Yes,the true reason was I had a doubt on my writing skills,and to be a newbie here .I think to hide my identity ,not expected that I will get brilliant response here.Just want to check my writing skills like Khud ko Azmana .I find this name good for blog. Amazing story!!! Many use to change their names in Bollywood and they are very successful… U have done the same here…and the result is tremendous!!! It’s just a beginning and I want to challenge myself higher and higher .But for this achievement ,sole credit goes to my readers.Many newbie starts blogging ,but due to lack of feedback and readers they quit it.If I didn’t get true feedback ,might be One day I also quit from here .We allways need motivation in our life,in career ,a true support.I’m glad that I have got one and now it’s my responsibility to prove myself and entertain my readers .Not to disappoint them. If I will get commendable response ,motivation from my readers .I will try every bit of my strength to entertain and provide them some unique contents. Gargi was a great Vidushi at time of Yagvalkya Rishi and she do Shastra at that time .It’s something pure in form .I know little about my name. Sorry,but I dont have a google translator.Would you please comment in english .